One hundred years of continuous service on behalf of military veterans is impressive. 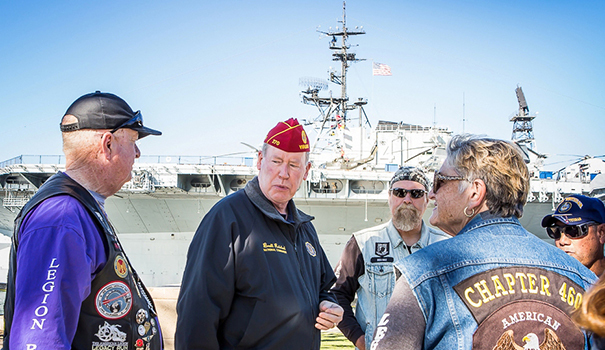 Welcoming the 2019 centennial of The American Legion, national representatives of the volunteer veterans service organization paid an early visit to Downtown San Diego on Jan. 3, beginning 100-year anniversary celebrations throughout the country. 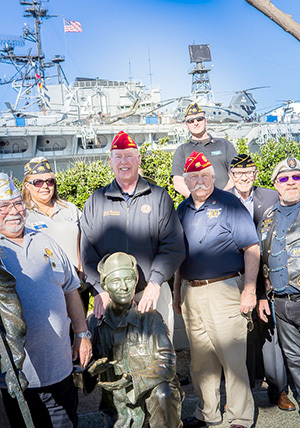 The American Legion National Commander Brett P. Reistad was escorted by American Legion Riders and other local Legion family members, during the early afternoon touring statues and sites along the Greatest Generation Walk near the USS Midway Museum on the Downtown San Diego Bay front. Reistad was elected national commander on Aug. 30, 2018. A member of the nation’s largest veterans organization since 1981, he resides with his family in Manassas, Virginia. Reistad served in the U.S. Army during the Vietnam War era. Active at all levels of The American Legion, he is past president and honorary life member of the National American Legion Press Association. The American Legion kicked off the centennial-year events on New Year’s Day, with Reistad and other veteran representatives honoring the occasion on the third float appearing in the annual Pasadena Rose Parade. On Jan. 1, day two of the yearlong commemorative activities, Reistad traveled into eastern San Diego County, for the re-dedication of the Ocotillo Wells Veterans Memorial Cross, followed by a meet-and-greet session at Santee American Legion Post 364. Reistad spoke to fellow Legionnaires during his multiple two-day stops throughout San Diego, mentioning the honor of being on the Legion float in the Rose Parade, and his gratification at being selected as national commander for the Legion’s centennial year. Reistad earlier on Jan. 3 received a presentation about a promising new treatment for combat veterans experiencing post-traumatic stress and related conditions. 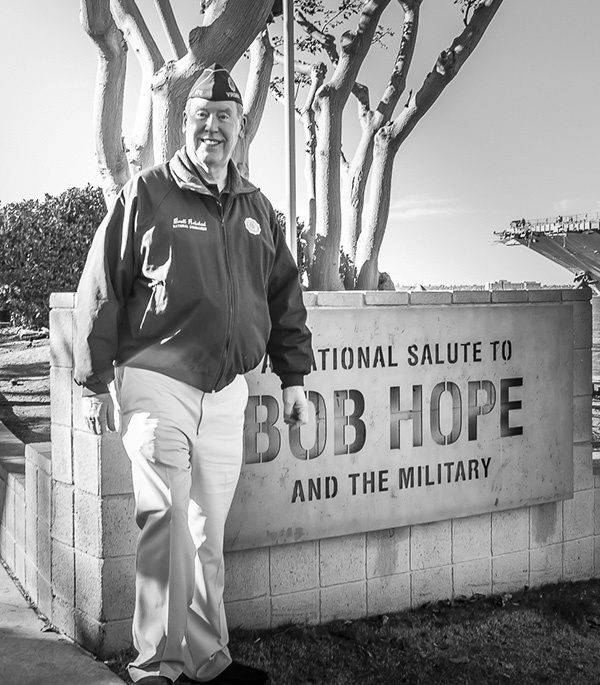 He toured Chula Vista’s Veterans Home of California before lunch there, and then stopped by the Downtown San Diego bayfront veterans World War II commemorative walkway. Reistad’s second busy day in San Diego County rounded out with a special national commander dinner hosted at Escondido’s J.B. Clark Post 149. The American Legion’s origins trace from Paris, France, to St. Louis, Missouri, through Washington, D.C., to Minneapolis, Minnesota — all in 1919. After World War I ended on Nov. 11, 1918, four Army line officers of the American Expeditionary Forces met in Paris in January of 1919 to renew acquaintances and share how other comrades from the war were faring in the aftermath. Those men were: Lt. Col. Theodore Roosevelt, Jr., who had served with the 1st Division; Lt. Col. George S. White, formerly with the 41st Division but later attached to General Headquarters; Maj. Erick Fisher Wood, of the 88th Division; and Lt. Col. William J. Donovan, of the 69th, proudly known as New York’s “Fighting Irish.” These men foresaw the need for an organization to formalize their efforts, and an announcement published in the newspaper Stars and Stripes for an open meeting in Paris led to a gathering over March 15-17, 1919, known as the Paris Caucus, which is now taken as The American Legion’s birthday. The Paris Caucus Executive Committee set up a subcommittee tasked with organizing veterans in the United States. A second caucus six weeks later was held in St. Louis, Missouri, from May 8-10, 1919, deciding to adopt the name “The American Legion,” and approving a draft preamble and constitution for the new veterans organization. In the interim, the first American Legion post was established in Washington, D.C., on March 7, 1919, receiving the first post charter on May 19, 1919. (This post was initially named for Gen. John Joseph Pershing, but the St. Louis caucus determined that Legion posts should not be named for living persons, after which American Legion Post 1 became George Washington Post 1.) From temporary organizing headquarters in New York City, Post 1 began a minimal set of programs focused on veteran relief, employment and Americanism. The National Executive Committee designed and adopted the Legion emblem on June 9, 1919. Congress granted a national charter to The American Legion on Sept. 16, 1919, as an official American patriotic society under Title 36 of the United States Code. The organization’s first national convention met in Minneapolis, Minnesota, from Nov. 10-12, 1919, representing veteran members whose numbers had already surpassed 700,000. That first Legion convention delivered a permanent constitution and elected the first slate of officers. The American Legion has worked to bring about significant accomplishments on behalf of veterans during the intervening years. One such early notable achievement, on Aug. 9, 1921, was the establishment of the U.S. Veterans Bureau, the precursor of today’s Veterans Administration. Two years later, on June 15, 1923, a Legion conference in Washington drafted the first “Flag Code,” which Congress adopted in 1923. And two years subsequent to that, the Legion created the American Legion Baseball Program, which continues as an effective program with each year with nearly 82,000 youth players on Legion-sponsored teams. Fast forward to the World War II years, and The American Legion actively responded to support emerging needs of the new veterans. The Legion in 1942 changed its organizational charter to allow World War II veterans to join as Legionnaires. The American Legion wrote the original version of the Servicemen’s Readjustment Act. Past National Commander Harry W. Colmery began this endeavor, writing the first draft in longhand on Mayflower Hotel stationery in Washington, on Dec. 15, 1943. Legislation based on it passed Congress, and President Franklin D. Roosevelt signed the measure into law on June 22, 1944. This was the GI Bill, which The American Legion considers the organization’s greatest legislative achievement. In recognition, Commander Colmery’s original draft is preserved at the Legion’s National Headquarters. Then came the Cold War, the Korean War, the Vietnam War, Desert Shield-Desert Storm, and Operation Enduring Freedom-Operation Iraqi Freedom — each with different problems and concerns for returning and non-returning veterans…. On Sept. 1, 1966, The American Legion began official expression of concern about the fate of prisoners of war in Vietnam. The Legion pressed for meaningful research into the effects of exposure to Agent Orange, into the possible causes of Gulf War Syndrome, and into effective treatment methods for post-traumatic stress disorder. The Legion continues these efforts today, calling for a full accounting of all military personnel from all conflicts who are not yet accounted for, and repatriation of their remains. The Legion has also pressed forward with community service for disaster relief and national security. On Aug. 24, 1969, the National Executive Committee established the National Emergency Fund to mitigate the devastating effects of Hurricane Camille. By June 11, 1997, the NEF surpassed the $1 million mark in cash grants provided to flood victims who were members of the Legion family, most of whom were residing in the flood plains of Ohio, Kentucky, Indiana, Minnesota and North Dakota. On Jan. 1, 1989, at Legion urging, the Veterans Administration was elevated to cabinet-level status as the Department of Veterans Affairs. And on Oct. 16, 1989, the U.S. Court of Veterans Appeals became operational, to improve adjudication procedures for veterans claims, based on the Veterans Reassurance Act, which was written by the Legion. The American Legion today still stands at the forefront on vital matters affecting veterans and citizens alike, under the rubric of the Legion’s “Four Pillars of Service,” which are Americanism, Children and Youth, National Security and Foreign Relations, and Veterans Affairs and Rehabilitation. The main American Legion Headquarters is located at the Indiana World War Memorial Plaza in Indianapolis. This facility houses the primary office for the National Commander and also is site of the historical archives, library, and the membership, internal affairs, public relations, and the magazine editorial offices. The Legion further maintains a building in Washington, D.C., for the offices of economics, legislative, veterans affairs, foreign relations, national security, and media relations.